W ow, where does the time go? I know people say that a lot when they become a parent but, oh how true it is! My own poor neglected blog is testimate to this, I haven’t blogged since Elliott was born… he is now 17 months! Becoming a mummy is the best thing in the world. I’m not going to say it’s all plan sailing, but wow the positives really outweigh the negatives. One of the strangest things both my hubby an I noticed was that it didn’t feel weird. When Elliott was born and I was sitting in the hospital, in a way it felt like he had always been there. Elliott was born around Christmas so that time was a bit a blur. Although there are negatives to having your birthday near Christmas, what was lovely was that it felt like everyone was celebrating with us. I had to face it, it is impossible to catch every key moment and every milestone on camera. I did take managed to take a photo every week so I could catch his weekly changes. When doing this one day I was lucky enough to catch his first smile. Very happy mummy! 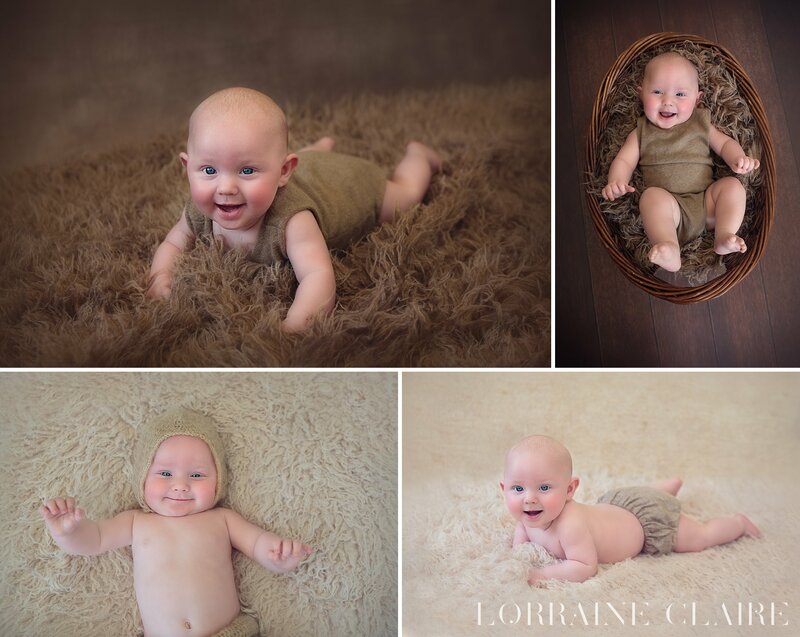 When Elliott was 4 months old I did another photo session with him. By then he was very use to seeing mummy with the camera but thankfully wasn’t fed up with it! At 7 months old it was time for Elliott’s Sitter Session. Bless him, he was a star as we worked or way though various outfits and set-ups. I nickname Elliott my Elliott Bear. 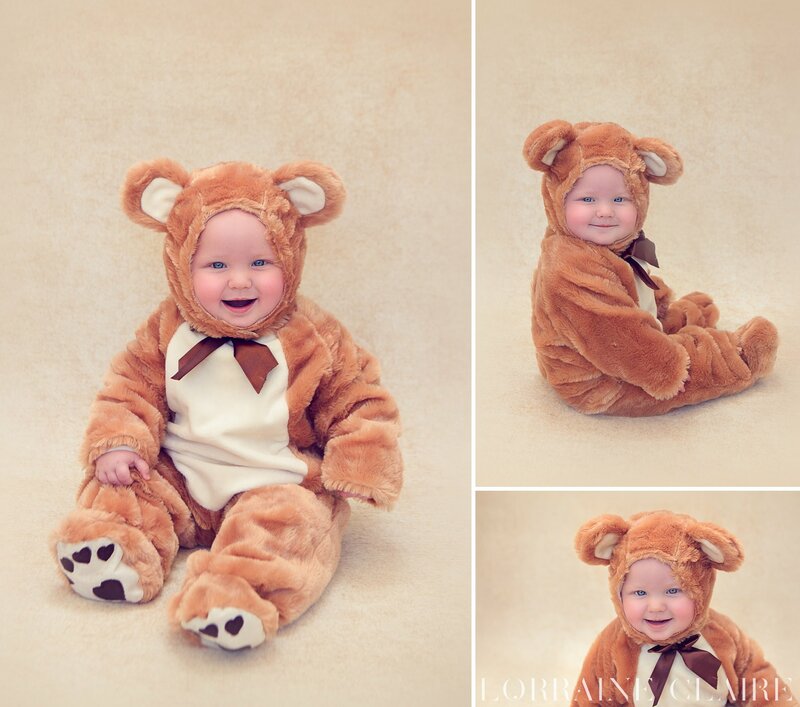 I only seemed fitting to get him a little bear outfit, which of course I just had to photograph… this is one for his 18th birthday! It was taken at 8 months. So, last October we moved 1 mile down the road from Knaphill to Bisley. I was SO EXCITED to move, especially as our new home has a lovely area which is just perfect for my studio photography. What I wasn’t so excited about was the leak that happened in the lounge a week after we moved in! For the next month and a half we lived in the back of the house in my ‘would be studio’, while the lounge was getting completely fixed. Thankfully the repair was all finished by the morning of Elliott’s birthday, just in time for his little party. The studio preparation were then on hold until after Christmas. Now it has finally been finished, hooray! Since Elliott has been born I have been on the most amazing adventure and learned a lot on the way! There is still so much more for me to learn and discover as a mummy but here are a few of my new mummy learns on my journey so far. Everything you think you will do, pretty much goes out of the window. Before having Elliott I was aiming for a natural birth, to be breastfeeding and not use a dummy. By month 2, I had had a C-Section, giving him a dummy and using a bottle. Now im taking each day as it comes and throwing my expectations out of the window. No I don’t only mean that you will get baby brain (I don’t think it ever goes), but I actually forgot I was a mummy. Elliott was 3 weeks old, I spent Christmas in Devon with my family. After being up most of the night I asked my lovely mother in law to sit with Elliott while I had a shower and got dressed. After enjoying a nice shower I chilled out in the bedroom and started reading a good book. Two hours later I had a feeling I had forgotten something. “Oh my gosh! Elliott! I have a baby and he’s downstairs waiting for me!”. I needen’t have been so concerned, as when I came downstairs he was fast asleep in my mother in laws arms, BUT the point was for that time I completely forgot I had a baby. There have also been times since, when I have had to double check the back seat when driving, as though sheer paranoia I feared he was not there… I can happily report that has never happened! For us anyway. As soon as I told people I was pregnant I got comments like ‘Say goodbye to sleep!’ and ‘Get all of your sleep in now’. In a way the comments were really helpful as I prepared myself for having nothing but sleep deprivation when Elliott was born. In reality it really wasn’t as bad as people made out. Especially after the first 3 months. So this isn’t actually a big learn as I know a lot of lovely people, but just to extent of peoples generosity was overwhelming. We didn’t really need to buy any baby clothes or much equipment, at all! Even people we didn’t know that well came to us armed with baby gifts. Our lovely new neighbours even knitted Elliott closes and brought him gifts. I will forever be grateful for all of the help we received. The Perfect Prep is my best friend. Ah the Perfect Prep. After having to switch to the bottle due to Elliott’s reflux, we found making up a bottle a bit troublesome. ?Bless, my lovely friend Samantha who got us a Perfect Prep. I don’t mean this to sound like an advert and I’m sure there are other alternatives, but oh my, it is SO GOOD! It helps make the bottle to the correct temperature and sterilises the water. I just wish I didn’t have to get out of bed at night to make it. The Baby Bouncer is my best friend too! Elliott’s little chair. We got so much use out of the Baby Bouncer. He would sleep blissfully for ages in it. It really came into its own at times when my arms were tired form holding time and I needed my own nap. For the times in the early days when you need something but cant or don’t want to leave home to get it, Amazon Prime is fab! From my husbands work we were given lots of Amazon vouchers, which were used up very quickly. If there is something you need which you don’t mind it being secondhand, Facebook marketplace is excellent to buy baby bits and bobs… its also great to sell any pieces too. There are SO many lovely parent and baby groups around Woking. Before I was pregnant I didn’t realise just how many lovely baby groups were out there. I joined an antenatal NCT class, from there I have met some lovely people. We went to baby sensory and baby massage together (Elliott particularly enjoyed the baby massage). The Sure Start centres are also amazingly helpful. In January 2016 I joined a First Time Mums group in the St Johns Sure Start Centre in Knaphill. I met a fabulous local group of First Time Mums. We’ve all been on many trips together and enjoyed watching our little ones grow. As a result I met some lovely mummy friends who I will treasure forever. Becoming a mummy has surpassed all of my expectations. I just feel so lucky to have Elliott and Rich (hubby). My boys are my world and I’m treasuring every moment with them.